Every once in a while, someone creates something so incredible that it probably wouldn’t even pass the Hollywood standard, being deemed to unrealistic. 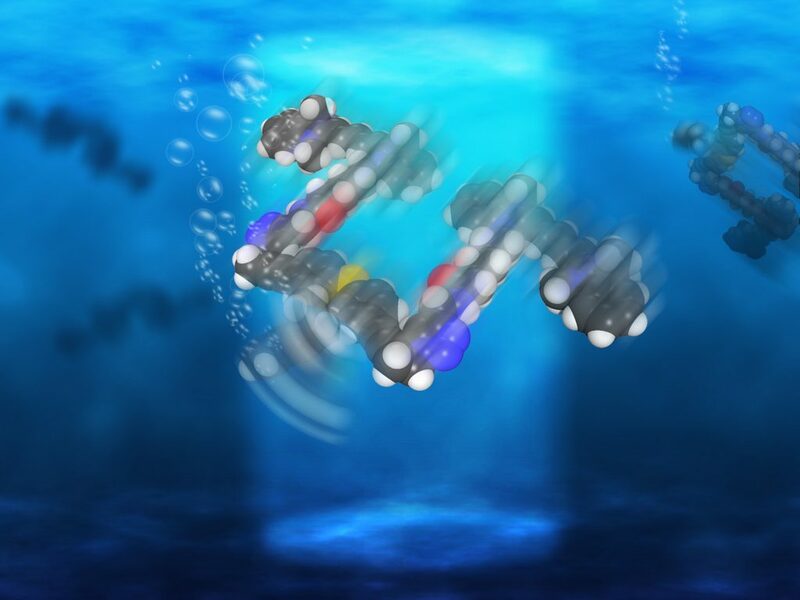 Researchers at Rice University have created a submarine consisting of a single molecule 244 atoms long that has a motor powered by ultraviolet light. “These are the fastest-moving molecules ever seen in solution,” he said. The propulsion mechanism is indeed ingenious: each time a molecule is hit by ultraviolet light, a double-bond in the motor becomes a single bond, rotating a quarter turn and moving the whole thing forth; the process is repeated on and off as long as it’s hit by light. Interestingly, this couldn’t work on “nanocars”, because the molecules will quickly go out of focus, whereas in liquids, they remain much more focused, allowing researchers to power them up with a laser (through a microscope). While the submersible can’t be steered, it can go through moving solutions, perhaps even in the human body. “This is akin to a person walking across a basketball court with 1,000 people throwing basketballs at him,” Tour said. The technology could be used, for example, to deliver drugs to a specifically desired area. Now that the concept has been proven, and the molecular sub is efficient, the next step is to push the boundaries and see how the maneuvrability of the nano-sub can be improved. It’s not the first time nano-machines have been developed – Tour himself has previously created nano-cars, but the problem is that most of these create toxic or harmful chemicals, so they can’t be used for delivering drugs, for example. Most notably, a motor that was conceived in the last decade by a group in the Netherlands proved suitable for Rice’s submersibles. Journal Reference: Unimolecular Submersible Nanomachines. Synthesis, Actuation, and Monitoring.